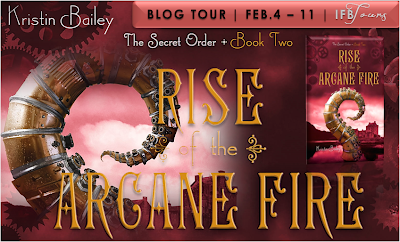 Welcome to my stop on Kristin Bailey's Rise of the Arcane Fire Blog Tour. 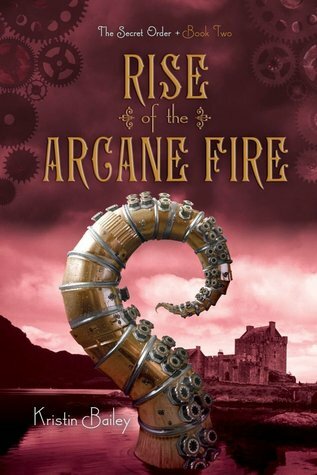 This is the second book in her YA Steampunk series, The Secret Order. I make a wicked homemade grapefruit and cranberry sorbet. It is awesome. I wait all year for cranberry season just so I can make it. If I’m out at an ice-cream shop, I can’t resist any ice-cream that is based on pumpkin pie. I know that it is painfully boring, but I love Cheerios. I don’t like it when they mess with the Cheerios with special flavors either. If you’re going to go boring for breakfast, go all the way. If I’m being completely honest though, I have to confess my very favorite thing to have for breakfast is leftover dessert. I’m a terrible night owl. When it is bad, I stay up so late I roll on over into early bird territory. Black Licorice. I cannot stand that flavor and it even irritates me when anise is used as a spice. Skittles! I like fruity candy and they are chewy to boot. I wanted to be a large animal or exotic animal veterinarian. After that, I wanted to be an animator for Disney. I still have a soft spot for Disney movies and horses. I would probably send my horse out for boot camp with a trainer. She could use it, and the more she knows the better. It is sad how quickly I could spend money on horse stuff. I like both. I love reading new things on my e-reader because I have limited space on my shelves, but I love a beautiful book, and there’s nothing like curling up with one on a rainy day. I haven’t seen The Desolation of Smaug yet, and I really want to see it. I loved “The Lord of the Rings” and though the first Hobbit movie was fun, even if it stretched out a little. More than anything, I want to see that dragon. The Madman’s Daughter, I loved the concept of a retelling of The Island of Dr. Moreau. I really want to read Under the Empyrean Sky. I just finished revisions on the third and final book in The Secret Order trilogy, so I’m still in the planning stages for a new book. I’m thinking about doing something with a darker and sadder tone. We’ll see. It is incredibly delicious, if you like tart things.